I don't have an overly extensive nail polish collection so a lot of my nail art is improvised with whatever I have. Sometimes I would even mix nail polishes to achieve the coloursI want. I love nail polishes in general and I am always open to trying new brands. It can be a cheap Sally Hansen nail polish, or an unknown from a small Korean beauty shop, or even expensive high end brand. So in this blog, I am just going to name the generic colour and not the specific brand just because if you want to achieve this nail art, I rather you use whatever you already have. Again, it's all about improvisation and ingenuity! Paint your base colours as follows: black (thumb, index, and middle), baby blue (ring finger), white (pinky). Allow it to dry. Using a dotting tool use the larger end to create large dark pink dots in a random pattern on your ring and pinky finger. Again using the smaller end of the dotting tool, gently add a small dot within the cherry circle to give it "shine". Finally use a toothpick to create a stem. 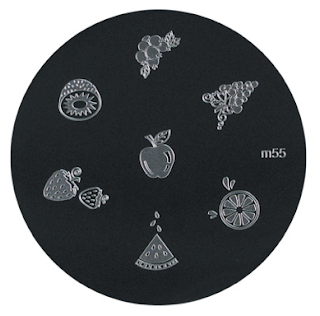 Use the M55 plate and Konad white special nail polish, stamp 2 apple image and 1 watermelon image. For the watermelon image, use a Q-tip to remove the seeds that has been transferred to the stamp. For the apples: use the lightest shade of the Konad special polish in blue and pink to fill in the apple. Then use the Konad special polish and place two small white dots within the apple to represent the core. Finally use a toothpick, dip it in to the darker shades, and draw in the leaves and stems. 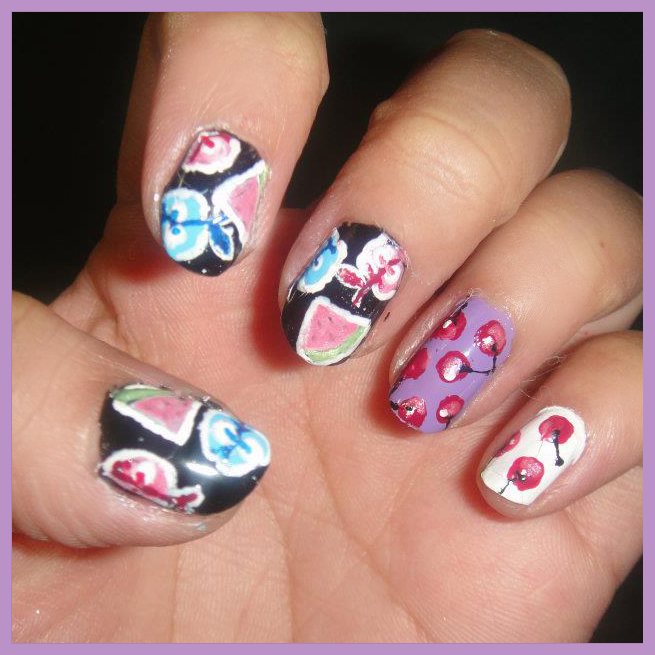 To finish off the nail art, use the small paint brush and outline the apples and watermelon.